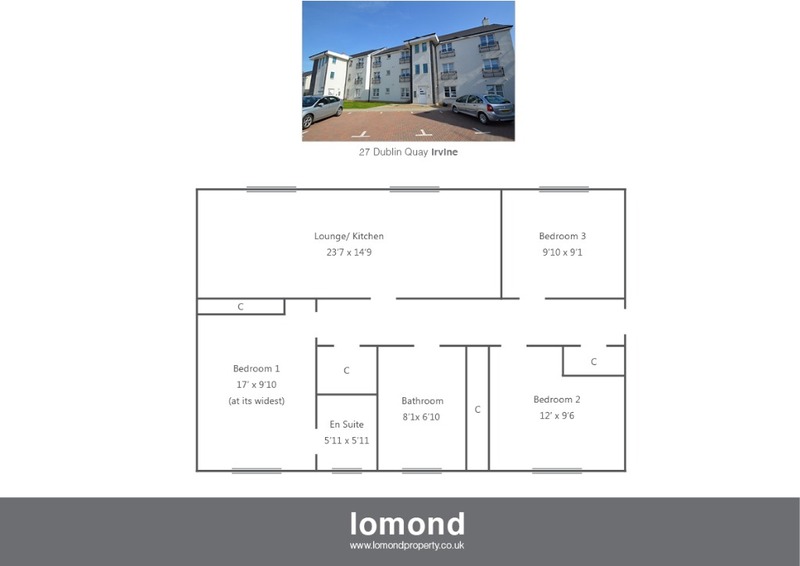 A rarely available modern three bedroom flat situated within the popular “Moorings” estate just a stone’s throw from Irvine’s harbourside, 27 Dublin Quay is just 4 years old and presented to the market in truly walk in condition. In summary the property entrance is gained through a secure door entry. The apartment itself is situated on the first floor, and comprises of an entrance hallway, leading to the property’s four spacious apartments. The living room is open plan to the kitchen, creating a stylish feel to the property’s main living space. The kitchen itself is finished to the highest of standards, with a number of integrated appliances such integrated fridge, integrated freezer, integrated dishwasher, integrated washer/drier, integrated oven, with induction hob and hood. The master bedroom is spacious with fitted wardrobes, and luxury en suite shower room. Bedroom 2 is also double in size with fitted wardrobe space. Bedroom 3 completes the apartment space on offer. The family bathroom is well presented with bath, over shower, WC and WHB. Storage is plentiful throughout the property, and viewing is highly recommended to appreciate the quality and space throughout the apartment. Externally the property has allocated parking to the front, with communal garden grounds. There is a bin storage area to the side of the property, made private with a perimeter fence. The property benefits from double glazing, and gas central heating. Dublin Quay is a pleasant residential area. Irvine town is close by and provides access to a range of amenities including supermarkets, bars, restaurants and town centre shopping. There are a number of local primary and secondary schools within the greater Irvine area. From our office in Bank Street, turn right onto East Road, continue forward and at the mini roundabout take you 3rd exit and continue forward , then turn left at the traffic lights onto Marress Road, and continue forward where at the next roundabout take the 3rd exit and continue forward to the next roundabout where you take the 3rd exit again into the Moorings estate. Continue forward and Number 27 Dublin Quay is found at the end of the cul de sac.